These are by far the best we have tried (and we have tried many organic versions). The main reason I bought them were for the heavy metal verification as my toddler loves these and I was concerned about heavy metals in other brands, even if labeled as organic. But besides being the only ones I could find that were tested for metals, these ended up being the best in terms of quality and taste. These little berries are absolutely DELICIOUS! Plus they are organic and free of any kind of pesticides. You can not find any organic goji berries in my area. I always travel with them as just a handful takes the hunger cravings immediately away, plus they are so good for you. Kids love them also! YUMMY!!! I sprinkled the Goji Berries over ice cream which made them freeze rather quickly, they became crunchy like eating nuts...very tasty. I also enjoy snacking on them knowing all the nutrition they provide. Thank you Mr. Mike Adams for going the extra mile for your customers! 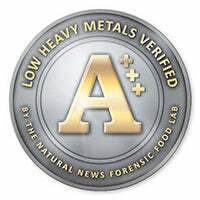 The Low Heavy Metals Verification is one of the primary reasons I chose your product over the many others available. I also like the quality of these Goji Berries--tasty and wholesome. Thank you again. I was not aware that Goji berries could taste the good! They were soft and chewy. Wonderful tasting! I can't stop eating them.